« A New Medical Center Is Coming To Sonoma County! Treat yourself this February! 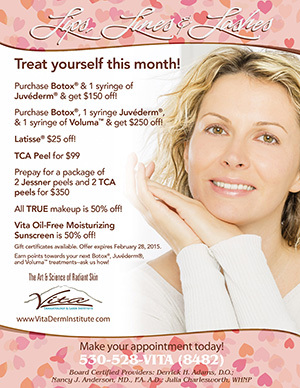 Vita Dermatology has some great new Cosmetic Dermatology Specials available through the rest of February 2015. » Purchase Botox® & 1 syringe of Juvéderm® & get $150 off! » Purchase Botox®, 1 syringe Juvéderm®, & 1 syringe of Voluma™ & get $250 off! » All TRUE makeup is 50% off! » Vita Oil-Free Moisturizing Sunscreen is 50% off! Visit the Vita Dermatology Blog for the official specials flyer. If you would like to make an appointment, visit the Vita website or call 530-528-VITA (8482) for more information.